This is another one that I've split between books that I remember, and books that I've read recently. In all honestly, there aren't any books from the main series that I particularly disliked, but there were some that I didn't care for very much or don't have any strong memories of. This seems like a rather big list, but to be entirely truthful, I really just have little niggling issues with the following books. From my childhood. This is one of the books that focused on Stacey and one of her many boyfriends, with an issue that was partly altogether too mature for someone who is thirteen and really shouldn't be having boyfriend problems, but also dealt with in a manner that seems appropriate for someone is thirteen. Here, Stacey goes on holiday with her dad and her best friend, Claudia, but spends all her time with her boyfriend, Robert, which annoys Claudia because she didn't tell her Robert would be there also. I suppose Stacey's Lie sparked my hatred of books surrounding "Big Misunderstandings"! This was one of the last BSC books that I ever read, once I'd almost altogether finished reading the series when I was almost eleven and had moved on to more "mature" literature...like Sweet Valley High! But a friend of mine was still really into the BSC and lent me this. I didn't particularly enjoy this book, maybe because I was growing out of the series or maybe just because the entire plot surrounded synchronized swimming, a hobby of Jessi's that was mentioned in one book and then never again! 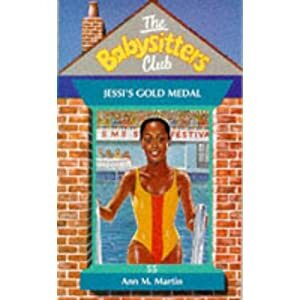 I adored ballet as a kid so normally loved the books about ballet, but Jessi's Gold Medal just didn't interest me. It's sad but true - a lot of my least favourite BSC books involved Jessi. I don't think it was anything in particular to do with her; her family was most like mine (small, little drama and not Caucasian [yes, I'm actually Anglo-Indian, despite the fact that my skin is literally white]) and I wanted to be a ballerina for a brief period when I was a child and even took classes for a while. By all means, I should have loved Jessi's books, but she just got the most boring or unrealistic plots! Here, I think, she babysits some bratty kid who is a movie star. Sadly, that's all I can remember about Jessi and the Superbrat so it can't have been that interesting. Here we have evidence that, yes, not only did Jessi get the worst plots, she also had some of the least flattering covers! 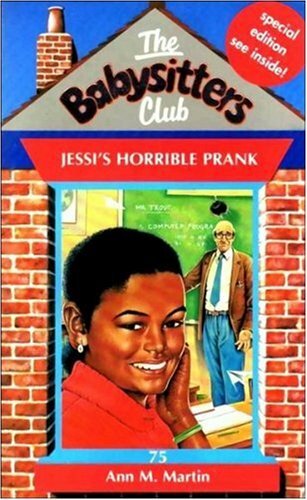 I honestly cannot remember what Jessi's issue was in Jessi's Horrible Prank, I'm not sure if she pulls a prank on the teacher or if she just doesn't stop the other kids from teasing him. I think this was another book that my friend lent me - she must have been a Jessi fan - but I do remember that the font on this cover was silver because it was the 75th book. I think it came with a free bookmark with vague paisley-style swirls on it. Not sure if it actually had much to do with the BSC, I imagine that they put a lot less thought into the UK releases than the US ones. But as an adult? I'd have to say that Stacey and the Mystery of Stoneybrook jumps to mind immediately. I think the whole BSC fan community is in agreement that the ghostwriter of this book was high when they wrote this book as it just isn't in keeping with the rest of the series at all. One of the weirdest, least-explained and just downright bizarre mysteries in the main series. 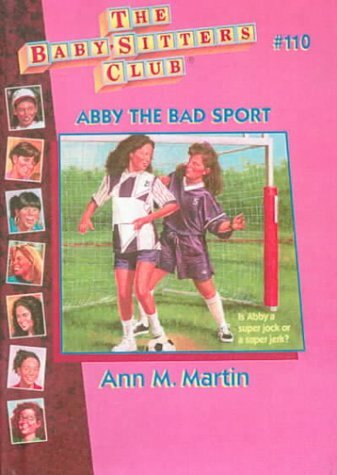 Then there's Abby the Bad Sport, and not just because it shocked me with the use of the word "mental-retardation". Maybe it was still considered PC to use this word in 1997, so I could be making a fuss out of nothing. Mainly, I just wasn't interested in a book about football, and most of this book focuses on either Abby playing football, the other girls watching Abby play football or Abby bragging about how good she is at football. (Or soccer, if you're American). (Also, this book never got published in the UK, hence the garish pink cover. I'm sure my copy is more of a baby-pink so this may be just a bad picture). I read Dawn's Family Feud fairly recently, actually over this particular summer. But despite this, I don't have any particularly strong memories of it, except that the kids were complete brats! Dawn, Mary Anne and Jeff were all very out-of-character. Although, I will admit, they probably acted like normal kids, it wasn't in keeping with their usual behaviour in the series. It reminded me a lot of Dawn's Wicked Stepsister, in which the problems seemed a bit contrived and then were fixed very quickly and never mentioned again. 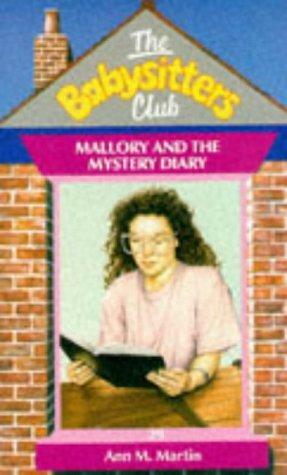 Finally, I'd have to say Mallory and the Mystery Diary. Why? Because I read it last year and can barely remember the plot. 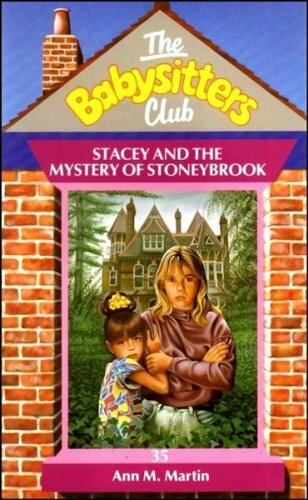 Except that I found it weird that the mystery belonged to Mallory, not Stacey, despite most of the story taking place in Stacey's house. Not quite as weird as Stacey and the Mystery of Stoneybrook, but definitely not very memorable. And the cover-art? Oh, my. Poor Mallory indeed! What's more distinct for you, your favourite novels or your least favourite? Do you have specific reasons why you don't like some of the books, or were they just not as interesting as others?